VeryPDF Barcode SDK offers barcode printing for Microsoft Office users and software developers. With this barcode generator software you create and print all barcode symbologies used in industry and commerce in excellent quality. 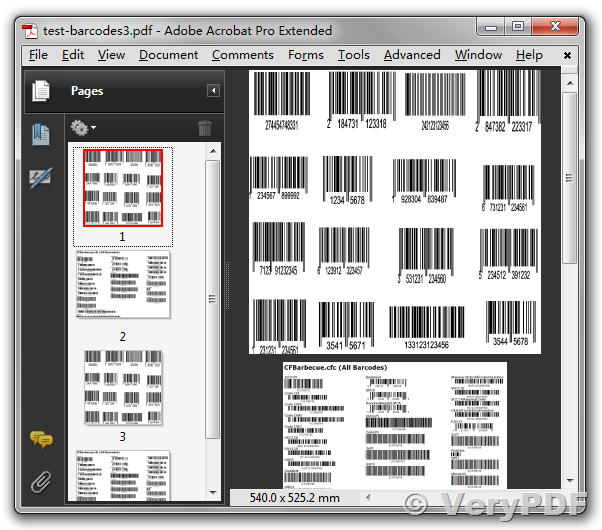 VeryPDF Barcode SDK represents a well-known set of barcode creation components. Outstanding quality and unmatched versatility have been convincing users and developers for more than 10 years. With VeryPDF Barcode SDK you are using barcode generator software, which has been successfully proven in countless stand-alone applications, server-based systems and reporting applications. The extensive support of linear, postal and 2D barcode symbologies (more than 100 barcode symbologies in total) makes VeryPDF Barcode SDK the perfect choice for each type of application. This barcode generator SDK is also in use in high-volume server-based Citrix or web-based systems. A perfect example for using VeryPDF Barcode SDK in a web application is VeryPDF's online barcode generator. You may also use VeryPDF Barcode SDK as barcode generator for ERP systems like Microsoft Dynamics Nav (Navision) or in various reporting systems. To cover special requirements or for embedded systems, VeryPDF Barcode SDK is also available for source code licensing. The source code of VeryPDF Barcode SDK is in use in mission critical environments on various big- and little-endian architectures. Just contact us for details. VeryPDF Barcode SDK covers all use cases and can be integrated into your own projects very easily. This entry was posted in Barcode Generator and tagged barcode api, barcode creator, barcode generator, barcode library, barcode pdf, barcode sdk, barcode writer. Bookmark the permalink.